Had a beautiful ride today up the Shields River Valley between the Crazy and Bridger mountains in central Montana. Peaks were capped with snow and the air was cool and crystal clear. All of a sudden the TPI was flashing and the rear tire pressure was going down; approximately 1 PSI every mile. Stopped, examined the tire and sure enough had a piece of glass in it. Wouldn't you know it, I left my tire repair kit in the garage (real useful there). Luckily, my riding companion had a plug kit and a mini pump. Now, I have CO2 cartridges but I can see the usefulness of having an electric pump. So, what are the best pumps and which should a person avoid. Thanks. I have an Air Hawk, its advertised on TV, works well but the TV add is a bit deceiving when it shows tires being inflated almost instantly. 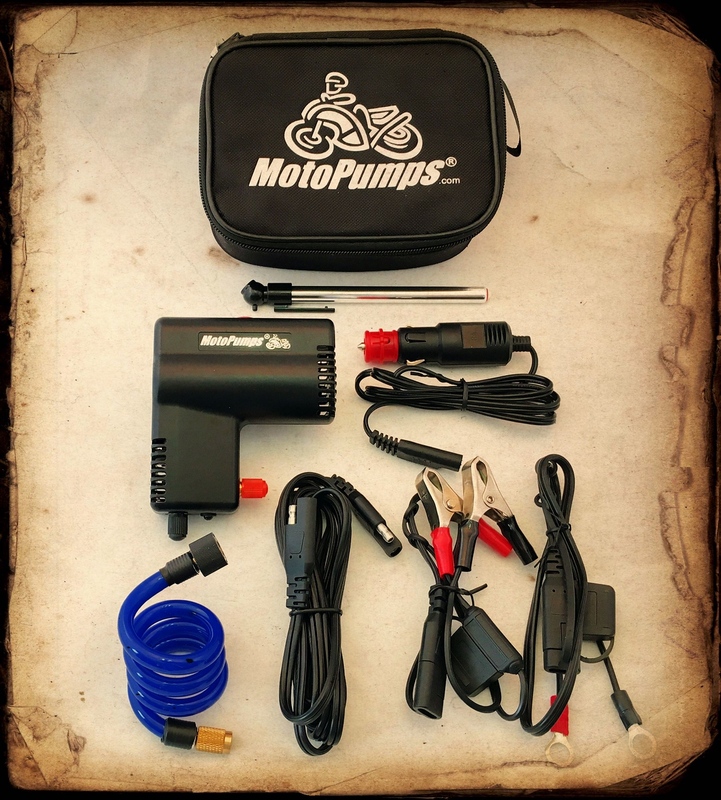 The Air Hawk is way slower than my small compressor, takes 60 or more seconds to add 5 psi of air but convenient to carry in the trunk of my car or in a saddle bag. It has a rechargeable battery as well as a cigarette lighter plug. Cost 59 bucks and so far Im satisfied with its performance. On day rides I carry a Slime pump. List price is $30 but sometimes auto parts stores have it on sale for $20. On trips I carry a Moto Pump Air Shot because of it's small size. I paid $50 with the ADV discount. Remove the red cap and you can check the pressure without disconnecting the pump. This shows my Slime pump on the left and Air Shot on the right. Thanks everyone. I see Amazon Prime is selling the compact slime pump for $27. I don't even know what brand it is, but years ago I bought one from Wally World. I found that you can take a generic compressor, remove all the plastic exterior and make it extremely small. As far as fast/slow pump up i don't know how it compares to other units, just that it works. For carrying something for emergency use only, it's fast enough and allowed me to help a rider or two in the past. I also recommend the BestRest tubeless tire patch kit. I take these things, along with my GS-911, any time I have the bags on my S1000XR. Lots of posts about Slime pumps, use the search tab above. Lost of posts about Slime pumps, use the search tab above. ^^^^ THIS is exactly what I was trying to describe in words in post 6 above. For all I can remember, Rick might have been my inspiration, it's been too long ago for me to remember.